Revered as a symbol of fertility, sexuality, purity and childhood, beloved as a children’s pet and widely represented in the myths, art and collectibles of almost every culture, the rabbit is one of the most popular animals known to humans. Ironically, it has also been one of the most misunderstood and abused. Indeed, the rabbit is the only animal that our culture adores as a pet, idolizes as a storybook hero and slaughters for commercial purposes. 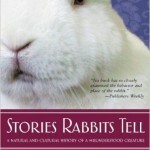 Stories Rabbits Tell takes a comprehensive look at the rabbit as a wild animal, ancient symbol, pop culture icon, commercial “product” and domesticated pet.